alaTest has collected and analyzed 127 reviews of Capresso 485.05 MT600 Plus 10-Cup Programmable Coffee Maker with Thermal Carafe. The average rating for this product is 3.8/5, compared to an average rating of 4.4/5 for other products in the same category for all reviews. Reviewers really like the design and durability. The performance and noise are also mentioned favorably. There are some mixed comments about the price. We analyzed user and expert ratings, product age and more factors. Compared to other products in the same category the Capresso 485.05 MT600 Plus 10-Cup Programmable Coffee Maker with Thermal Carafe is awarded an overall alaScore™ of 84/100 = Very good quality. Brews coffee quietly and quickly in the morning. Very good instructions for use. Lots of other consumers complaining of same issue. I love everything about the coffee maker and pot but the steam vent in the top but easy to use and coffee taste great! The brew is fast and the stainless steel carafe keeps coffee hot! Seeing water level when filling machine presents some problems. Very nice appliance ,it looks sharp on the counter , easy to program and it brews a pot very fast . The only problem I see is the cafe seems to not be very well insulated it's ok but not as great as everything else about this coffee pot . 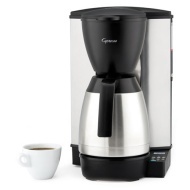 Most products in the market carry either 4 cups or 12+ cups coffeemakers. It is hard to find a good size with stylish design. This one is perfect and very sleek. Gave up on Capresso's Grind and Brew version because it didn't work well with my French Roast (oily) beans. Purchased this and a separate grinder. Makes excellent coffee. Excellent purchase - would recommend to others.